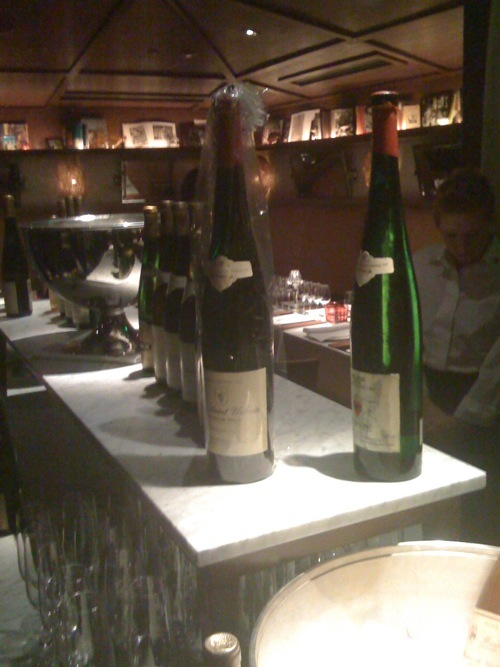 I just attended an awesome Alsatian wine dinner (mostly Zind Humbrecht)! We were treated to a wonderful 20 course menu at The Bazaar by Jose Andrés at the SLS Hotel in Beverly Hills. The new back room of this restaurant is lovely and comfortably seats 24+ guests. The chefs "molecular gastronomy" magic was excellently executed and delicious. 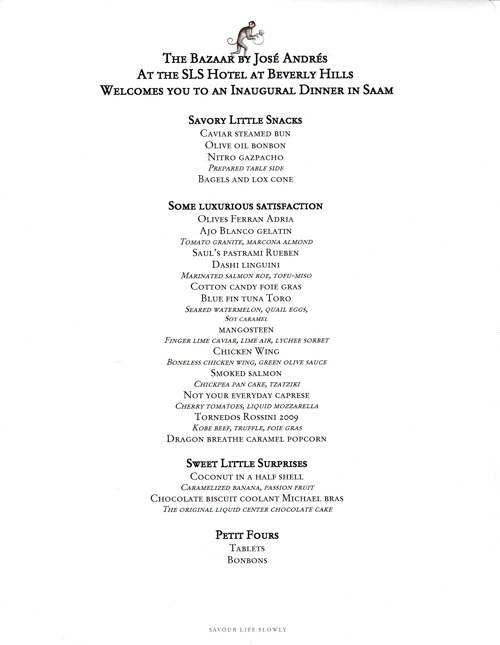 The amazing menu is below. In addition to the menu, we had a small sample of Iberico pata negra to start which was delicious. As guests gathered we had a few openers of bubbly. I didn't take detailed notes of any of them. We started with a lovely Pierre Moncuit Cuvée Millesimée Blanc des Blancs 1996 which was rich, toasty, silky and delicious, drinking quite nicely right now (Three Stars). Next I tried the Scharffenberger Brut Rosé which was tasty but not memorable. The Duval-Leroy Brut 1996 was also very pretty but much more higher toned than the Moncuit, a little angry even. Vibrant, but that intense acid needs to settle down a bit if this is going to be truly great (Two Stars). Note on scoring: Zero stars = not recommended, not necessarily flawed however. One star = a nice wine worth drinking. Two stars = an excellent wine by any standard and worth an effort to search out. Three stars = a truly outstanding wine. Zind Humbrecht Brand Riesling Vendange Tardive 1983 Magnum - What beautiful bottles these magnums are! This wine seemed to be a bit polarizing, no doubt due to its intense petrol on the nose and flavors. I for one like this aspect of older Rieslings and found this intriguing. Any way you slice it, this has an intense personality, jumping out at you with petrol, gravely wet stones and hints on botrytis. Quite dry in the mouth, the intense petrol and granite continue on the palate along with grapefruit pit and a silky, long, mineral-imbued finish. I really liked this a lot. Two Stars Plus. Zind Humbrecht Brand Riesling Vendange Tardive 1989 Magnum - Although the same wine from a different vintage, this Brand was quite different in personality. Creamy tangerine, flowers and chalk aromas but clearly younger and more hesitant. In contrast to the intensity of the 83, this 89 is more ethereal, light on its feet with hints of citrus oils. This still seems young in terms of its flavor evolution, but if I had to be picky I'd say it was a tad diffuse, without the focus and cut of the other wines in this flight. Two Stars. Zind Humbrecht Rangen de Thann Clos Saint Urbain Riesling 1989 Magnum - Despite being from a different vineyard, this had a similar nose to the Brand 83 with an abundance of stones and petrol. This was really impressive in the mouth, strutting its stuff like a Clos St. Hune with all its "liquified rocks" personality. Hints of honey and flowers play second fiddle to the intense minerality. The clarity and precision of this was impressive and it elegantly reverberates on the finish for minutes. Three Stars. Schoffit Grand Cru Sonnenberg Riesling 2005 - I don't have nearly as much experience with Schoffit as with Zind Humbrecht but this wine blew me away! In a sense it wasn't typical, at least on the nose, as this had a very expressive floral, honeysuckle-like aroma with hints of wax and wool. I wouldn't have guessed Riesling blind and probably would have thought this was a Muscat, maybe even a Gewurztraminer. What really blew me away about this wine though was its fabulous mouthfeel. The pretty, floral flavors were carried on a super finely-grained texture of ultra-silky, powdered even, stones. Imagine granite ground down to the texture of powdered sugar. Awesome texture, so subtle, understated, elegant and pretty. Three Stars. Trimbach Cuvée Frédéric Emile Riesling 2001 - Crisp, white peach, salt and granite in the pretty nose. Lovely silky stones, light and ethereal. Although this doesn't quite have the noble spherical nature of the Schoffit it is fine and improved with air, showing more intense minerality. Two Stars Plus. Trimbach Cuvée Frédéric Emile Riesling Vendange Tardive 2001 - While I was looking forward to the impressive vertical of Rangen to follow, this was really turning out to be a great flight! One of the best of the night actually. This had a similar profile to the previous wine but actually more mineral despite the addition of some additional honey and botrytis. Subtle and quite pretty. Two Stars Plus. Zind Humbrecht Rangen de Thann Clos Saint Urbain Pinot Gris 1991 - Definitely one of the wines of the night, this 91 Rangen impressed us all. Simply beautiful waxy rose petals capture your attention and won't let go. Creamy, silky and long, this is just a great Pinot Gris, ethereal and just beautiful. Three Stars. Zind Humbrecht Rangen de Thann Clos Saint Urbain Pinot Gris 1992 - This too is very pretty but quite a bit less expressive than the great 91. In the mouth however this is quite a bit more viscous, oily and waxy. Fatter and with a hint of botrytis. This was very pretty but didn't quite have the calm grace of the 91. Two Stars Plus. Zind Humbrecht Rangen de Thann Clos Saint Urbain Pinot Gris 1995 - There was a lot of discussion about this one but at least a few of us were a bit put off by a strange dill, Bubbies pickle thing going on in the nose in addition to some smokey tea. 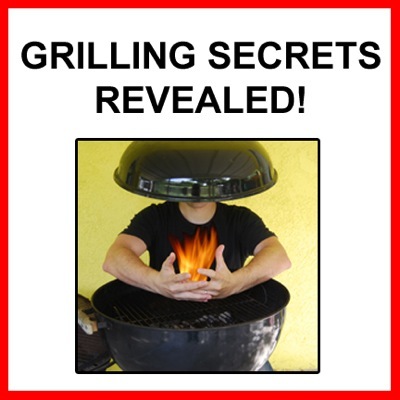 Pungent flavors are quite high toned and even a bit coarse. This is a bit questionable for me. It wasn't entirely unappetizing but it had some awkward notes that I couldn't get around. For this bottle I'd give One Star but with a big question mark. Zind Humbrecht Rangen de Thann Clos Saint Urbain Pinot Gris 1996 - Some people loved this wine, I suppose because of the fat, sweet fruit. To me, this too seemed off. I've had several Zind Humbrecht 96 PInot Gris in the past and this doesn't seem like a good representation. This had a raisined, almost oxidized, jammy fruit to it that was fat, too sweet and kinda flabby for my taste. Judgement reserved because I think oxidation may be playing a role here. Of note, it was quite a bit darker in the glass than any of the other wines in this flight. In fact the 91 was the lightest of the bunch despite its age! Zind Humbrecht Rangen de Thann Clos Saint Urbain Pinot Gris 2001 - This reminded me a lot of the 91 from a decade previously but younger and less expressive. The same waxy rose petals are clearly evident. Rich and deep, this is like the 91 on steroids. While it doesn't have the calm grace of that older wine, this has an amazing energy and power. Outstanding. Three Stars. 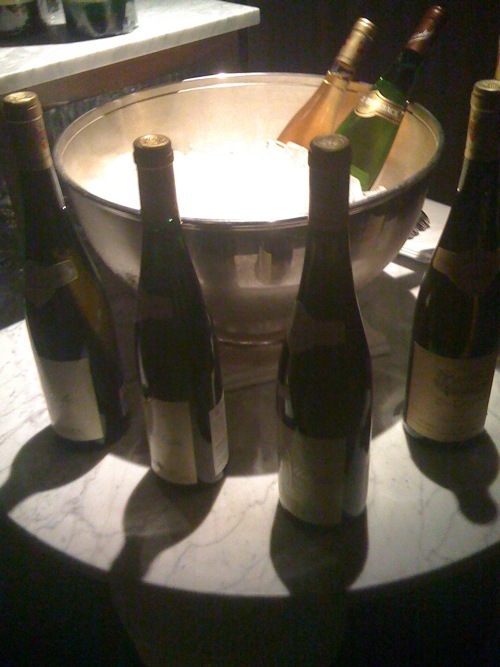 Zind Humbrecht Rangen de Thann Clos Saint Urbain Pinot Gris 2003 - Some people really liked the 03 but I didn't love it. More floral and diffuse, it had a waxy, rich pineapple flavor. However, the midpalate was airy and diffuse without depth or presence. Nothing offensive, this was a pretty wine, but not nearly as complete as the best vintages here. One Star. Zind Humbrecht Rangen de Thann Clos Saint Urbain Pinot Gris 2005 - This seems to only suffer from its young age. More subtle and hidden, it seemed tight but clearly has vibrant underlying fruit. Also seems a bit sweeter. I think this should show better with more time. One Star Plus for now but will likely improve with age. Zind Humbrecht Rangen de Thann Clos Saint Urbain Pinot Gris 2006 - Woah! What happened here! Odd, oxidized with a really dark color in the glass. Also a weird bacterial-like thing going on in the prickly, awkward palate. Clearly a flawed bottle. Judgement reserved. Bonus Wine: Zind Humbrecht Clos Windsbuhl PInot Gris 1996 - A glass of this was handed to me to try. Earthy, truffle honey aromas almost seem to lean towards the oxidized size. But this was much better than the Rangen 96 with lovely subtly sweet fruit, chalk and earth. Very Pretty. Two Stars. Zind Humbrecht Clos Windsbuhl Gewurztraminer 2002 - Lovely classic Gewurz lychee, wax and roses followed by a rich, nutty wine with a hint of sweetness. This is very pretty. Two Stars Plus. Zind Humbrecht Herrenweg de Turkheim Gewurztraminer 2003 - I didn't like this one bit. Smokey lychee in the nose but flavors are kinda weird, hollow in the middle and kinda fell apart and got more and more awkward in the glass as it breathed. Zero Stars. Trimbach Seigneurs de Ribeaupierre Gewurztraminer 2001 - This seems older with honeyed truffles, earth and roses in the pretty aromas. Velvety, rich and pungent. This was nice, but didn't have the completeness of the best wines of the night. Maybe my palate was just getting a bit tired. One Star Plus. Zind Humbrecht Rangen de Thann Clos Saint Urbain Gewurztraminer 2002 - This was more closed than the Clos Windsbuhl. Also sweeter with a bit of botrytis seeming more like a VT, but it remained pretty well balanced. Very nice, but a notch below the Clos above. Two Stars. This dinner was just great and many thanks to Saul for arranging it and supplying many of the great wines (not to mention the delicious pastrami)! Done with the Zind Humbrecht and Alsatian wine tasting notes? 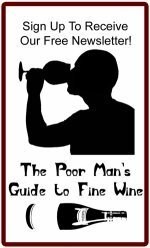 Return to the Wine Tasting Guide Tasting Notes page.